The modern Italian national health service is a Beveridgean system centred around GPs and funded by central taxation.1,2 In order to become eligible to work as a GP, Italian doctors need to undertake a 3-year postgraduate training in general practice.3–6 The latter training — governed nationally by the Italian Ministry of Health and locally by the various Italian regions — is organised by the primary care establishment.3–6 By contrast, all other postgraduate medical specialties in Italy are organised by universities and are governed by the Ministry of Education, University and Research (MIUR). These various aspects of the GP training may be further amplified with reference to research. Since there are no primary care departments in Italian medical schools, there are no opportunities to pursue a PhD in family medicine in the country. Research in primary care is conducted only by isolated centres, such as the Mario Negri Institute for Pharmacological Research in Milan. There is no provision to develop a GP network with an accessible national database for population-based studies, such as the UK Clinical Practice Research Datalink or the UK Biobank. Unlike the Italian situation, in most EU countries academic general practice pathways are now available and considerable progress has been made in this field over the past 20 years. Northern European countries, including the Scandinavian countries, the Netherlands, and the UK are leading the way. Almost all post-communist Central and Eastern European countries have set up primary care departments and included family medicine in the undergraduate medical curriculum.18 Most Southern European countries, namely Portugal, Greece, France, Slovenia, Croatia, and Malta have also developed academic GP training curricula.8,18–20 In 2016 the Spanish Academy of Family Medicine was also established.21 Italy, therefore, is currently the only Southern member of the EU still without academic general practice. Setting up an academic pathway for Italian GP training is therefore an essential turning point to keep up with the best practice in the rest of Europe. attracting the best medical students and strengthening the reputation of family medicine. introducing a research doctorate with a thesis in the field of primary care as a basic requirement for a GP professorship. (2011) The Oxford Handbook of Health Economics (Oxford University Press). Primary care In Italy. European Forum for Primary Care. www.euprimarycare.org/column/primary-care-italy. accessed 9 May 2017 . 1991 Legislative Decree 256/1991. Official Gazzette of the Italian Republic. www.gazzettaufficiale.it/atto/serie_generale/caricaDettaglioAtto/originario?atto.dataPubblicazioneGazzetta=1991-08-16&atto.codiceRedazionale=091G0300&elenco30giorni=false. accessed 7 Jun 2017 . Legislative Decree 277/2003. www.parlamento.it/parlam/leggi/deleghe/03277dl.htm. accessed 9 May 2017 . Legislative Decree 368/1999. www.camera.it/parlam/leggi/deleghe/99368dl.htm. accessed 9 May 2017 . Decree 7 March 2006. www.formazionespecificaregionelazio.com/sites/files/decreto_7_marzo_2006_c_17_normativa_722_allegato_0.pdf. accessed 9 May 2017 . Law 109/1988. Official Gazzette of the Italian Republic. http://www.gazzettaufficiale.it/eli/id/1988/04/09/088G0164/sg;jsessionid=Mls7SMBvCmn0zw2ef2I2Vg__.ntc-as4-guri2b, (accessed 7 Jun 2017). (2016) International primary care snapshot: academic primary care in Italy. Br J Gen Pract 66(642):34, doi:10.3399/bjgp16X683197. A survey on the GP training: tutors rejected and uneffective clinical practice. www.sanita24.ilsole24ore.com/art/commenti/2014-04-11/MMG_SCHIFO-085634.php?uuid=AbWUSBbJ&refresh_ce=1. accessed 9 May 2017 . Equalizing the GP training with secondary care training. www.sanita24.ilsole24ore.com/art/lavoro-e-professione/2016-07-26/formazione-smi-miur-scuola-specializzazione-la-medicina-generale-e-riforma-concorso-145712.php?uuid=AD9HH3x. accessed 9 May 2017 . Petition to reform the access and structure of the GP training. www.movimentogiotto.org/index.php/93-petizione-ss-mg.html. accessed 9 May 2017 . (2013) Undergraduate medical education in general practice/family medicine throughout Europe — a descriptive study. BMC Medical Education 13:157, doi:10.1186/1472-6920-13-157. The academic teaching of general practice and primary care. www.simg.it/attivita/aree-cliniche/area-insegnamento-universitario/linsegnamento-universitario-della-medicina-generale/. accessed 9 May 2017 . (2015) Challenges to the surveillance of non-communicable diseases — a review of selected approaches. BMC Public Health 15:1243, doi:10.1186/s12889-015-2570-z. (2016) The impact of primary care organization on avoidable hospital admissions for diabetes in 23 countries. Scand J Prim Health Care 34(1):5–12, doi:10.3109/02813432.2015.1132883. (2015) The state of population health surveillance using electronic health records: a narrative review. Popul Health Manag 18(3):209–216, doi:10.1089/pop.2014.0093. (2004) Linking physicians' pay to the quality of care — a major experiment in the United Kingdom. N Engl J Med 351(14):1448–1454, doi:10.1056/NEJMhpr041294. (2013) The development of academic family medicine in central and Eastern Europe since 1990. BMC FamPract 14:37, doi:10.1186/1471-2296-14-37. (2014) Primary care research in Portugal: we need to generate more enthusiasm. www.cmajblogs.com/primary-care-research-in-portugal-enthusiasm/. accessed 9 May 2017 . 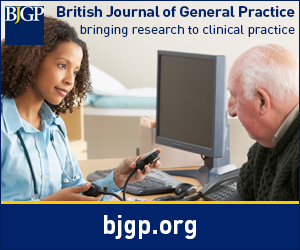 (2014) Patient and professional attitudes towards research in general practice: the RepR qualitative study. BMC Family Practice 15(1):136, doi:10.1186/1471-2296-15-136. (2016) Spanish Academy of Family Medicine: a body necessary to promote family medicine as an academic discipline, as a specialty, and as a profession. Med Gen Y Fam 5(3):75–76. (2000) Academic careers in general practice: scientific requirements in Europe. Europ J Gen Pract 6(2):62–65, doi:10.3109/13814780009094306. (2011) Time for a national undergraduate curriculum for primary care. Br J Gen Pract 61(593):721, doi:10.3399/bjgp11X613043.